Inspired by the beautiful tree-lined streets that surround it, Oak Row embodies a unique blend of city and suburban life. From the ground up, this brand new community to has all the features and amenities you would come to expect from an exceptional luxury community. 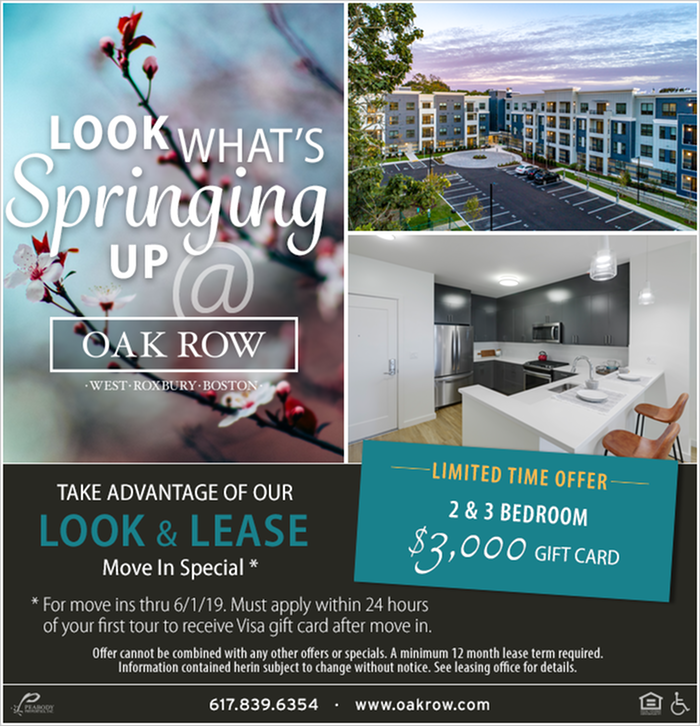 These West Roxbury, MA apartments are pet friendly, including a pet wash, grooming station and dog run. Get work done from home – the work lounge is fully equipped with WiFi, a conference room and private work pods. Our multi-functional fitness and wellness center host state-of-the-art cardio theater and TRX. We have what you've come to expect from a luxury community, we just make it better. We're giving you more choices in your living space. Break free from the mold and choose from our stunning one-, two-, and three-bedroom floor plans featuring over 20 different layouts, ensuring you find the home that is perfect for your needs and lifestyle. Live in a community that's on the edge of the city, and close to it all - near a diverse mix of shopping, restaurants, cafés, coffee houses, schools, and entertainment destinations. The nearby Millennium Park offers a host of recreational options including walking and jogging trails, playgrounds, a canoe launch, ball fields, and picnic areas. Get from your door to downtown Boston in less than 30 minutes. No car? No problem. Go car-free! Enjoy complimentary transportation provided to the West Roxbury MBTA Commuter Rail station on Lagrange Street during peak morning and evening travel times. The community is also serviced by bus 36, 37, and 52 and hosts +community bike storage and a bike repair station at the building. No matter what hobbies or interests you have, you'll be right at home in West Roxbury. Find the floor plan that speaks to you and give us a call to schedule a tour. 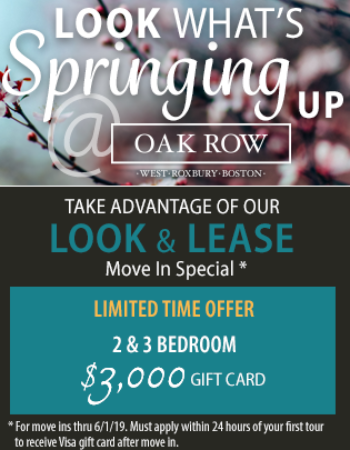 We can't wait to have you here at Oak Row.